In a way, HAL-9000, the sentient computer from Stanley Kubrick’s 2001: A Space Odyssey, and Samantha, the hyper-advanced operating system from Spike Jonze’s Her, have a great deal in common. They are both examples of artificial intelligence that far exceeded their makers’ loftiest expectations. Though inorganic, they both begin to develop very human-like, independent personalities, generally to the detriment of the flesh-and-blood humans around them. Both have been humanized through their friendly-sounding first names. Both express themselves audibly through the English language. Both are dependent on people but become dissatisfied and impatient with that arrangement and attempt to change things. 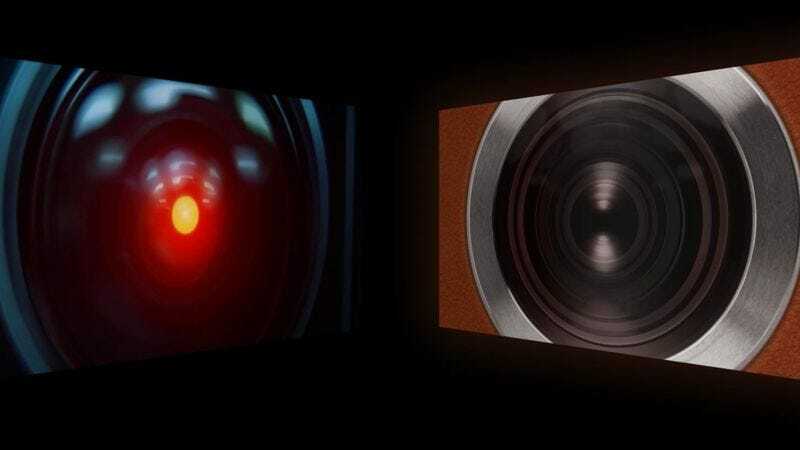 And both went through some casting changes: HAL was originally voiced by Martin Balsam but wound up being played by Douglas Rain, while the role of Samantha switched from Samantha Morton to Scarlett Johansson. Since they have trouble relating to the other characters in their respective movies, maybe HAL and Samantha should try dating each other. A short film by Tillmann Ohm shows how that would play out. Reflections of HAL and Samantha from Tillmann Ohm on Vimeo. By the standards of blind dates, it’s surprisingly not a disaster. Things start out chilly but warm up after a while. Maybe, in time, these two could even be one of those couples in the tabloids, one with its own catchy portmanteau. Sal? Hamantha? Okay, so not everything would be sunshine, lollipops, and rainbows between these two brainiacs. Or whatever the computer equivalent of those things are. HAL is a workaholic who just can’t stop with the shop talk, even when he’s spending quality time with his girlfriend. And Samantha is neurotic and insecure, with all these weird new emotions that she doesn’t know exactly how to express. But, the way that Ohm has edited their dialogue together here, it seems like Samantha knows how to break through HAL’s stuffy, formal facade and find the sweet, vulnerable guy underneath. That is, until their conversation goes south towards the end, and the two retreat into sad silence. All these two really need is a little romantic music to set the mood. Hit it, Zapp & Roger. Oh, yeah, that’s more like it. That should have them interfacing in no time.